The 95-year-old self-made multi-billionaire Quintus Grummond collapses from heart failure and enters a state of brain death. Meanwhile, his son Oswald makes plans for his father to never again awaken. Oswald hires a shyster lawyer who attempts to legitimize Grummond’s termination by claiming that the multi-billionaire is no longer truly alive and that he has given Oswald “implied consent” to make decisions regarding his fate. This play depicts a battle over a principle: the question of whether anybody has the right to terminate an innocent individual’s life against his explicit wishes. 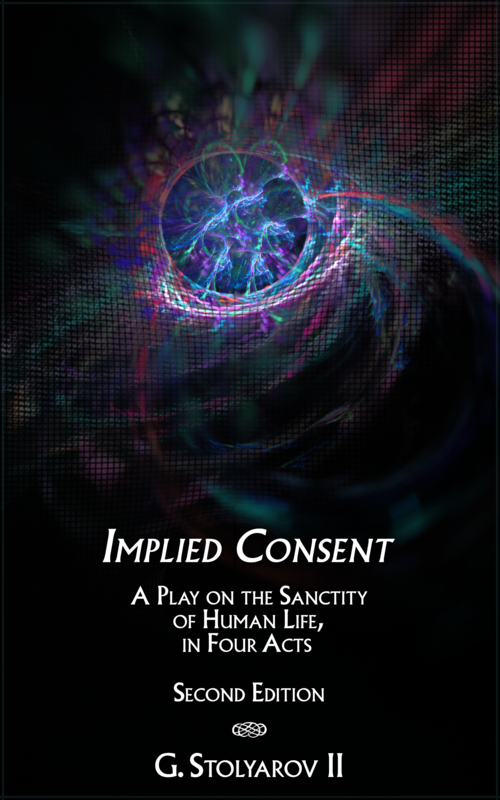 This is the Second Edition of Implied Consent, with original and freely downloadable cover art by Wendy Stolyarov. This play was originally written in December 2004 and January 2005; the First Edition was published in May 2007. The Second Edition of Implied Consent is available in PDF, MOBI, and EPUB formats. The Rational Argumentator welcomes your reviews of Implied Consent. You can submit them to TRA by sending them to gennadystolyarovii@yahoo.com. You are also encouraged to spread the word by reprinting the information on this page or your own comments concerning the book on other media outlets.